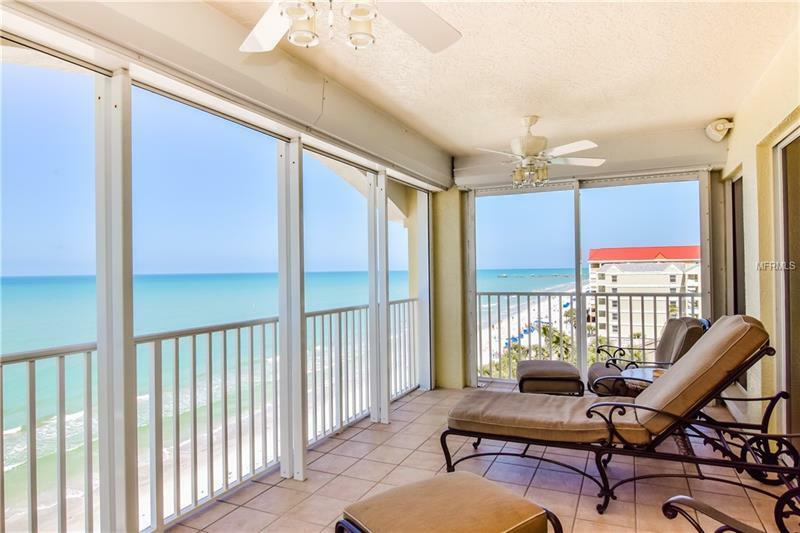 PENTHOUSE GULF FRONT LIVING WITH VIEWS FROM EVERY ANGLE! This penthouse unit in the sought after Sereno Building of the prestigious TIDES BEACH CLUB, is now available! Enjoy the security of a grand gated entrance and pull into your underground parking space, right next to the elevator. Located on the top floor, at the most Northern point of the building, this home features STRIKING OCEAN VIEWS that make you feel as if you can dip your toes into the ocean from the unit. Interior upgrades include gorgeous TRAVERTINE FLOORS, ARCHED WALLS, custom designed copper CEILINGS, Hunter Douglas Blinds throughout, Pyramid SOUND and LIGHTING throughout, gold flaked compliments, imported fixtures & so much more! The MASTER SUITE includes HIS & HERS WALK IN CLOSETS, a deep soaking tub, dual vanities & access to the large screened lanai. The split floor plan offers 2 additional bedrooms + an OFFICE/DEN that can also be used as an extra bedroom. This premium unit also includes its very own beachfront cabana, providing storage for beach toys, a mini wet bar, and fridge. Luxurious community amenities include 3 beachfront pools plus a hot tub, complimentary ice machine, fitness center & clubhouse. Get ready to experience paradise at its finest in this ultimate, luxury residence. Additional Water Information: Beachfront Private Cabana is also included with the sale of this condo unit. Pet Restrictions: Breed Restrictions and pet weight limit of 35lbs or less. 2 pets max.